Analyst Calls The Old Republic a "WoW Clone"
According to one market analyst, Star Wars' "far far away" galaxy is just Azeroth with a fresh coat of paint. Cowen and Company analyst Doug Creutz seems rather disappointed by BioWare's Star Wars MMO, The Old Republic. He's says that it's "highly derivative" of Blizzard's massively successful World of Warcraft, and not the "major step forward" that BioWare and EA had promised. Creutz said that he was "largely unimpressed" with what he had seen of the game and that The Old Republic was essentially a copy of WoW with some Star Wars textures slapped on the top. Not particularly good ones either apparently, at least not from Creutz's point of view, as he said that the visual were "competent but hardly breathtaking." He was similarly unimpressed with the game's conversation system, saying that it had been bolted on to the game - and implying that it didn't really make that much of a difference - and that it was the same "nice/nasty" mechanic that BioWare has done countless times before. Creutz may have a point; when our own Steve Butts got to see TOR at E3, he noted that some of the mechanics weren't exactly new. 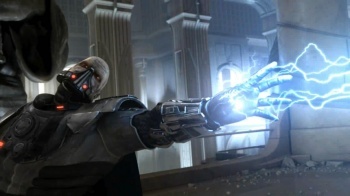 He also pointed out, however, that a lot of what BioWare had promised about the game couldn't really be shown off in a E3 demo, and could really only be experienced "in the wild," so to speak. Whether Creutz's impression of the game will improve when the game eventually enters beta testing remains to be seen, but EA - and its stock prices - are undoubtedly hoping that the answer is "yes."